Built by London-based coachbuilders, Radford, the Mini De Ville GT was essentially a bespoke and more luxurious variant of the ubiquitous Mini Cooper and Cooper S. This particularly colourful example has an incredible history, having been gifted to Beatle, George Harrison, and featuring in the Fab 4’s Magical Mystery Tour. Despite the current paint job, it was originally delivered to Harrison in metallic black and with bespoke touches like Volkswagen taillights, rally-style fog lights and a full-length sunroof. 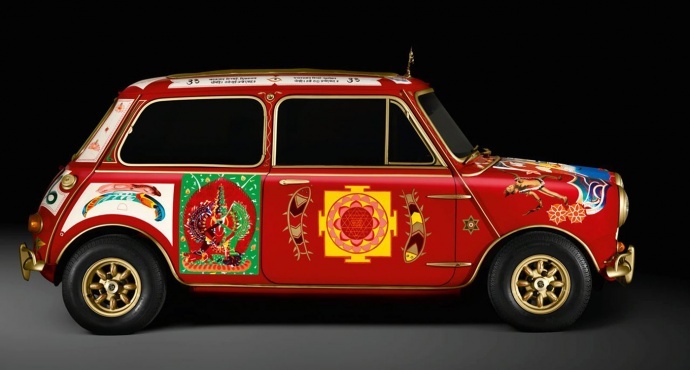 One of four Radford Minis delivered to The Beatles, this car was then painted bright red and finished with “Tantra Art” symbols. It was then that Harrison’s Mini appeared in ‘Magical Mystery Tour’, before being gifted to Eric Clapton. Clapton eventually gave the Radford Mini back to George Harrison, although the ‘Tantra Art’ was long gone and never fully recorded. As it stands today, the paintwork was recreated from footage taken from Magical Mystery Tour and some period photographs. If you want to see George Harrison’s Radford Mini De Ville GT in the metal, you’ll have the chance at the Concours of Elegance 2016, hosted at Windsor Castle from September 2-4.